I use this road on my commute home. I turn left from London Wall on to St Martins Le-Grand prior to joining Little Britain to cut thru’ to Smithfields and Clerkenwell. Over xmas the road was quiet enough for me to turn left in the new lane and then cut across two lanes of on-coming traffic to enter Little Britain. This evening traffic will be returning to normal levels and I shall find out if this manoeuvre is still practical or if I have to turn left from outside the lane and ride into the outside lane before turning into Little Britain. I cycle this road every day and find the new layout horrible. I turn left towards St Pauls, so have the best of it, but it’s still ugly. The bit that scares me the most is the big blob of white paint on the roundabout itself which seems supposed to create some kind of merge zone for cyclists, but actually seems to function solely to funnel cars straight into the cycle lane. 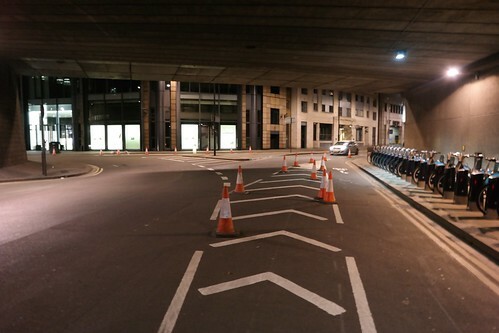 The reduction to one way is also creating tailbacks along London wall as traffic merges – I can see once the cones go away that cars will simply encroach on the lanes. It’s never been a good roundabout, but this seems to have made it worse. 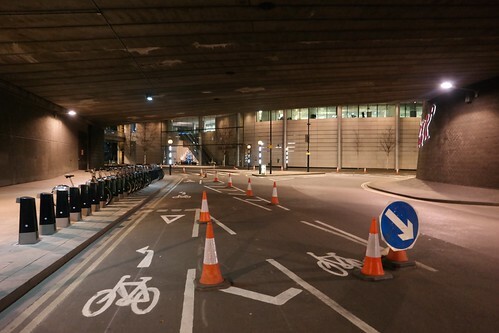 I cycle out of London Wall into Aldersgate Street every morning, and from Aldersgate Street into St. Martin’s Le Grand every evening, and I find these changes outright dangerous. Especially coming from London Wall, there is now one column of traffic, and cars turning left force cyclists along with them, because straight-going cyclists are still to the left of cars! On top of that, the merging of the two lanes on London Wall is way too late, so that many cars basically stay in the cycling lane, knowing that they’ll turn in a few meters. By the way, to complain about this, you need to email plans@cityoflondon.gov.uk. Not sure my earlier comment made it – the new marks westbound on London Wall have vanished this morning, leaving nothing but some burnt-off and damaged tarmac. Oh, that’s interesting. I wonder if it was just a short term trial to see how they would work? 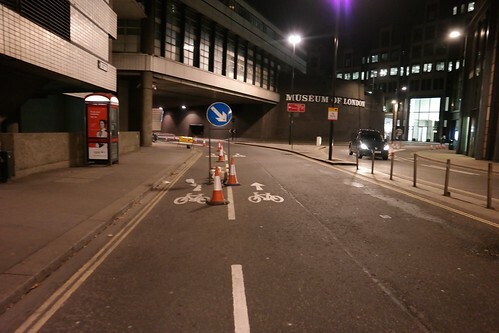 The City of London is trialling a new layout at the Museum of London roundabout to make the junction safer. The junction is being monitored daily for performance and safety. According to recent data, this junction is the City of London’s fourth most dangerous junction. In the last 3 years, there were 14 collisions and 9 of those injured were cyclists. This low cost trial seeks to make the junction safer whilst a major project is being developed to improve the whole area. Making dangerous junctions safer is a significant component of the City of London’s Road Danger Reduction Plan. Local occupiers were consulted on this trial and the scheme was presented to the City’s Streets and Walkways Committee for approval. The resultant westbound delays on London Wall were much greater than envisaged causing issues with the network work resilience and increased the risk of collisions at other sections. The monitoring results of this trial at the roundabout are scheduled to be presented to the next Streets and Walkway’s Committee. To reduce the risk of the trial at the roundabout being totally decommissioned. Restoring two lanes westbound on London Wall was considered necessary to provide a better balance between traffic movement and road safety. We acknowledge that the current layout is not ideal for cyclists, however, we believe it is an improvement from what was before the trial. As 11 of 14 collisions were recorded in the north-eastern corner of the roundabout where the trial facilities for cyclists have been retained. No further changes are planned and we hope to have an extension to our trial period of the roundabout layout. I think a site visit should be combined with examining the quietway route due to go on the nearby route by barbican by the end of 2016. This should be publicised in a month or two. I initially disliked the new layout but I missed it last night. Vehicle traffic was moving faster and closer to the kerb, and I was unable to filter past the queues of traffic at the entrance to the roundabout because black cabs were tucked as close to the kerb as possible. As I entered the roundabout traffic was also moving faster (more space, higher speed?) so making my right hand turn into Little Britain was more fraught than usual. Has anyone cycling in this area worked out what to do when you want to get from Chiswell Street, down Wood Street and across London Wall, heading towards Gresham Street? Travelling south-bound down Moor Lane and onto Fore Street, the new building works for London Wall Place have closed off Wood Street as you head towards London Wall. There doesn’t appear to be a safe/non-long-way-round route to get from (e.g. Finsbury Square), to the south bit of Wood Street (you cannot turn right out of Fore Street, you cannot travel south along Moorgate to London Wall etc) that doesn’t involve completely circumventing the entirety of Barbican. .
Only solution I’ve found is to ignore the ‘Road Closed’ signs on Wood Street, mount the pavement and push your bike over the pedestrian refuge on London Wall, then re-mount at the Pret at Wood Street.